Pryority is teaming up with Grounded Mediation to bring the ultimate mind-body programming to town - Meditation! This ancient healing practice is the ideal way to reduce stress, control anxiety, improve memory and sleep, reduce blood pressure and boost your immune system. The Meditation practice doesn’t need to be time consuming or uncomfortable; most people find a regular Meditation practice is an easy, non-intimidating way to bring balance and center to mind, body and spirit. Mantra Mediation repeats a word, phrase or sound and is sometimes paired with breath to maintain focus. Commuter Meditation is the perfect way to ground yourself ahead of a busy work day. With the Pryority center adjacent to the Metro North station, it’s possible to meditate before jumping on the train. Mindful Meditation bring the mind back to present by focusing on breath and labeling thoughts. In the Buddhist tradition, this is done with half-opened eyes. Visualization Meditation visualizes something tangible, focusing on a specific object or scene. Diane Nickelberg-Barnett is the founder of Grounded Meditation and a successful NYC Real Estate attorney who realized years ago that she needed something to help balance the stress and chaos of her busy and demanding career. 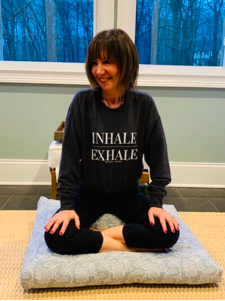 A lifelong interest in health, fitness and spirituality drew her into the world of meditation and yoga where she found that these peaceful practices served to counteract the constant stress of practicing law. Her passion for these disciplines, paired with the desire to help others, has naturally led her to teaching, and she feels honored and blessed to be in a position to help her students find balance and quiet in their own lives. Diane has been teaching for about ten years and has been fortunate to be able to share her knowledge with students in both the private and corporate world.